POSTED: Mon, 04/21/2014 - 05:00 | POSTED BY: Traci C.
There are plenty of iconic and fan-favorite snacks at the Walt Disney World resort, including Dole Whip, schoolbread, and Mickey ice cream bars. But over the last few years another snacks has been added to the "must eat" list of Disney foodie fans. 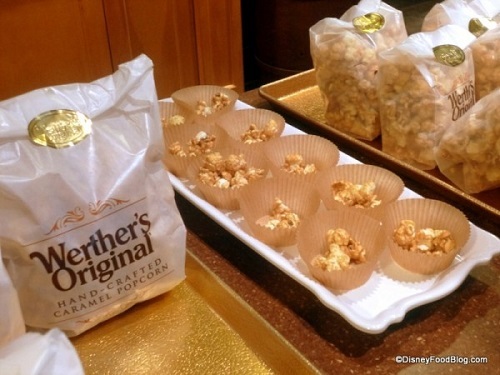 We're talking about the homemade caramel corn from Karamell-Kuche in Epcot's Germany pavilion. Karamell-Kuche (Germany for Caramel Kitchen) opened in 2010 and has quickly become a go-to destination for guests who want to satisfy their sweet tooth. 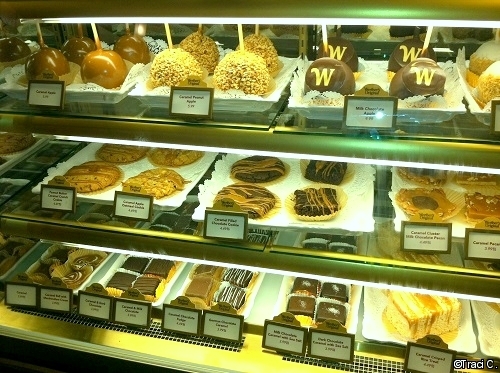 Even before you walk through the doors of the shop you can smell the sweet caramel and you know you're in for a treat. All of the items in the store are crafted with Werther's Original Caramel (the shop is sponsored by Storck USA, the company that makes Werther's Original Caramels). No matter if you walk in to Karamell-Kuche determined to buy just ONE bag of hand-crafted caramel corn, you might have a hard time stopping yourself from buying anything else once you spy the amazing display case filled with caramel goodies. The Karamell-Kuche display case is filled with caramel and chocolate covered apples, caramel popcorn cupcakes, chocolate covered caramel squares with sea salt, chocolate covered strawberries drizzled with caramel, cookies, and more. Our friends at the Disney Food Blog have a great review of some of the delicious menu items found at Karamell-Kuche. And of course there's the popcorn. We're talking about the hand-crafted caramel coated popcorn sold in two sizes, small or large bags. Sometimes you'll get lucky and they'll be handing out free samples. 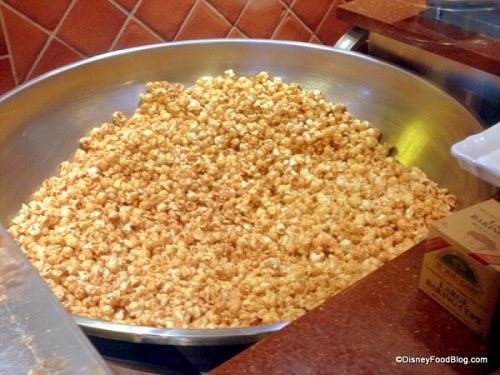 The popcorn is made fresh every day in the store and if you're a fan of caramel corn, this is definitely a must-have snack. To make this treat even sweeter, a small bag (which is a perfect size for an afternoon snack) will only cost you one snack credit on the Disney Dining Plan! And if you're paying cash it's about $4. There is usually a line snaking through Karamell-Kuche but it moves rather quickly, sometimes too quickly if you're trying to make a decision at the display case. There have been many times where I've had to tell the person behind me to just "go around" me as I tried to choose my sweet treat for the day. 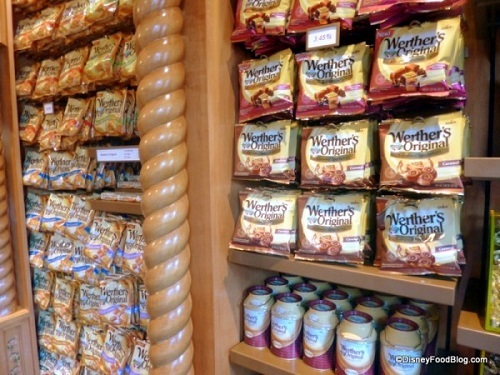 And since the shop is sponsored by the parent company of Werther's, you'll find a wall full of Werther's brand products including their famous hard candies. What is your favorite snack from Karamell-Kuche? Leave us a comment and let us know! Many thanks to our friends at the Disney Food Blog for use of their very delicious-looking photos! yeah...I have no shame...this is my favorite store in the World Showcase. 24 days until caramel apple!! Yum! Had to share your post on my blog! Love their caramel! Totally agree! The caramel popcorn is awesome and usually save my snack points to get a few bags to take home.I tell everyone in line about it and they end up buying at least one bag. Love the caramel corn but the chocolate covered pineapple is to die for. Best snack store around.